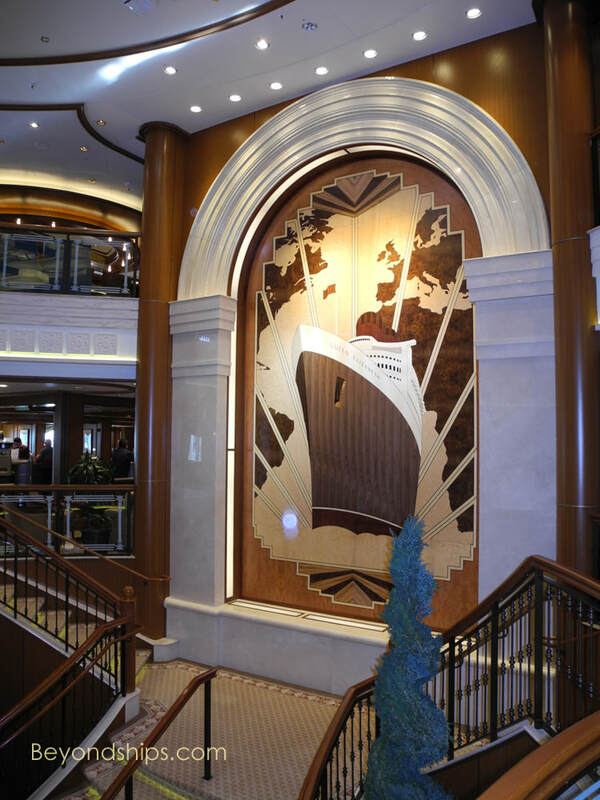 The central atrium overlooking the Grand Lobby features a marquetry panel depicting Cunard's first Queen Elizabeth. Queen Victoria) and continues the line's strategy of overlaying the style of the grand ocean liners of yesteryear onto a modern cruise ship. This ship is the second largest Cunarder (i.e., Cunard ship) ever built. Although she is considerably smaller than fleetmate QM2 and many of the mega-cruise ships sailing for other lines, she is still quite a substantial ship. As a result, she offers the features people expect from a modern passenger ship while at the same time having a relatively intimate atmosphere. 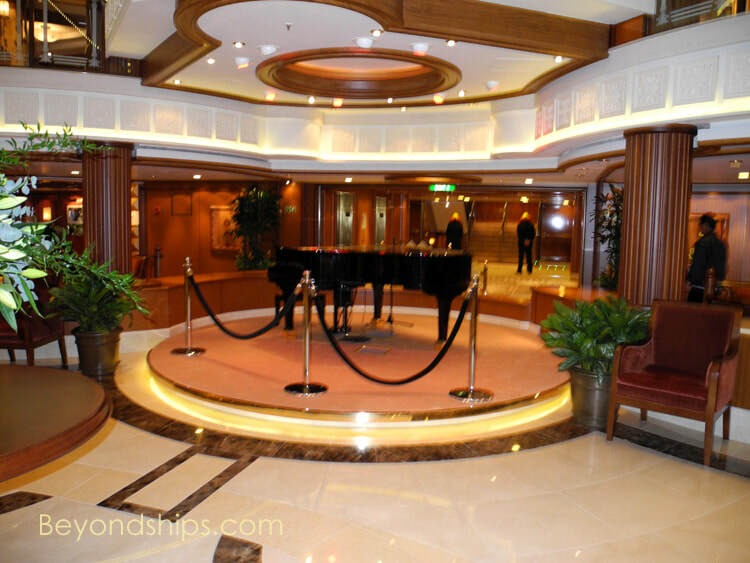 but tradition explains why things are often done in ways on Cunard ships that are different than on other lines. It all goes toward weaving a spell in which the guests come to realize that they are participating in something that goes back nearly two centuries and includes royalty, statesmen, movie stars and other celebrities. This Queen Elizabeth is named in honor of two past Cunard ships. While other lines reuse names; typically, one has to look hard to find more than a passing reference to the current ship's predecessors. On Queen Elizabeth, the predecessors' names and images are everywhere. The second ship was also be called "Queen Elizabeth". However, at the naming ceremony in 1967, Her Majesty Queen Elizabeth II added "the Second" to the ship's name and she became known as "Queen Elizabeth 2" or "QE2". (See profile of QE2). For nearly 40 years, QE2 was the most famous ship in the world. The current Queen Elizabeth carries several QE2 artifacts and images. The Queen Elizabeth is a close sister to Cunard's Queen Victoria. Originally, the two ships differed primarily in the fact that QE had some additional staterooms at the stern giving the ship a square-off look compared to Queen Victoria's terraced stern. However, during a refit, QV was given more staterooms and a squared-off stern. As a result, the two ships silhouettes now differ primarily in that Queen Elizabeth has a fabric-covered games deck on the forward part of the superstructure, which QV does not have. Inside, Queen Elizabeth is art deco in inspiration whereas Queen Victoria is art nouveau. However, both ships have elements of both styles. 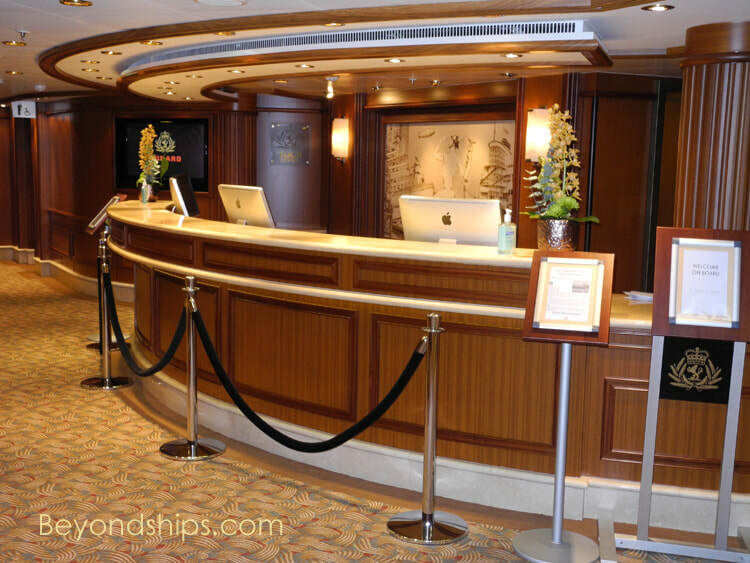 Cunard ships attract an international mix of passengers. The exact composition of that mix depends very much on where the ship is sailing. Queen Elizabeth is an elegant and sophisticated ship. 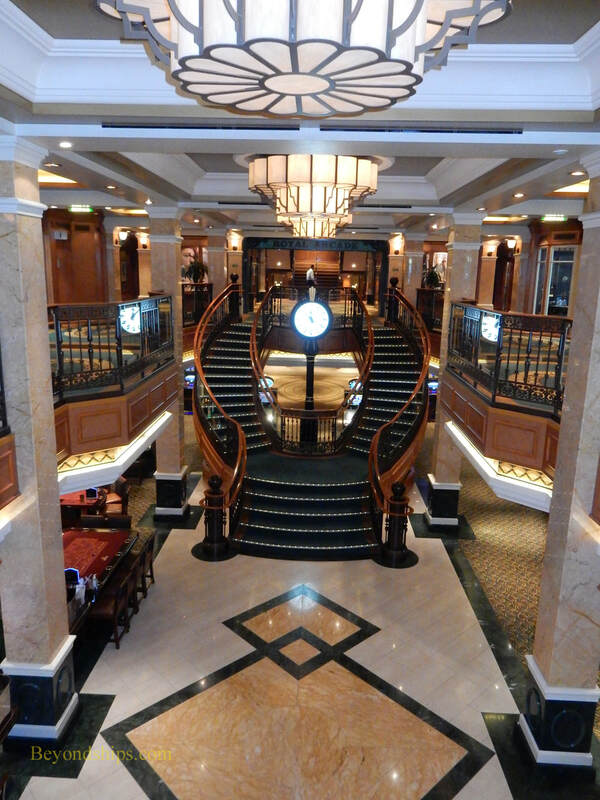 In addition to the atrium over the Grand Lobby, the ship has a forward atrium inspired by London's traditional shopping arcades. 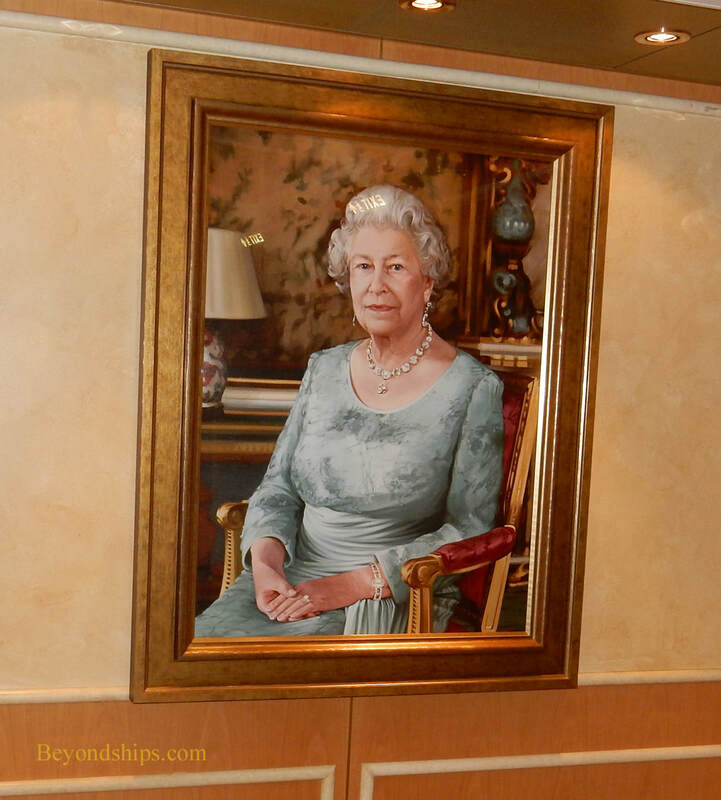 The ship was named by Her Majesty Queen Elizabeth II who sat for a portrait to mark the occasion. 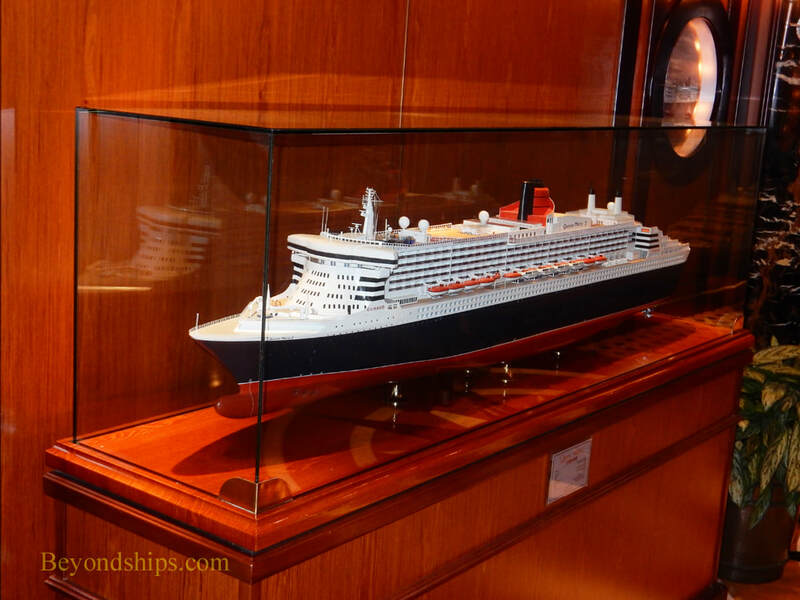 Queen Elizabeth is rich in nautical memorabilia including maritime paintings and ship models. 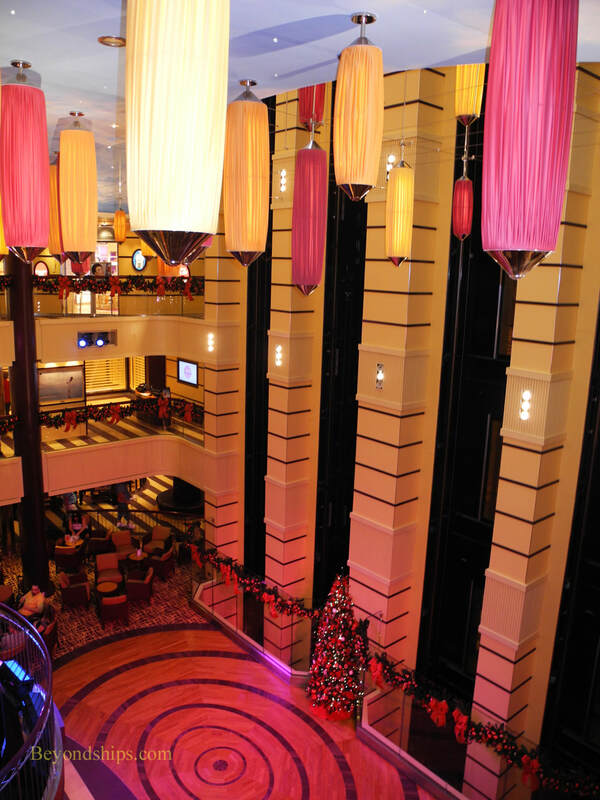 At the center of the Grand Lobby is a grand piano. On the starboard side is the Purser's Office (not shown) and on the port side is the Tour Office (shore excursions) (above right).